Anthony J. Van Zwaren, Esq. P.A. I have practiced law since 1996. I began in New York and New Jersey, but since 2005, I have limited my practice to New Jersey after opening my own office. 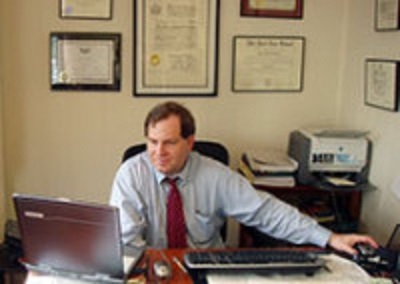 My practice involves a focus on family law, traffic and minor criminal offenses. I have handled cases covering a wide range of areas. I started in civil litigation, handling cases of insurance defense, personal injury cases, property damage claims against insurers and the like. My firm offers help for people seeking divorce, changes in child custody or child support, landlord-tenant matters and dealings with traffic court. My municipal court practice involves handling motor vehicle tickets for things like speeding, driving while suspended, driving while unlicensed as well a wide variety of disorderly persons offenses handled in our Municipal Courts. I also handle child abuse cases representing parents who have the Division of Child Protection and Permanency (formerly "DYFS") having served as a pool attorney for the Office of Parental Representation and handling cases of accusations of abuse and neglect on behalf of parents. Additionally, I also handle various types of civil cases including collections matters, contract review and representing clients who have been sued in automobile cases who lacked sufficient or any insurance coverage. I appear frequently in landlord tenant court representing both landlords and tenants in eviction proceedings. My firm also handles criminal expungements. You may contact my office at 973-246-9659 if you wish a consultation. For traffic cases yes, otherwise $100.00 for the first half hour. Traffic tickets, uncontested divorces, and some civil litigation matters. $300 per hour except for traffic cases. Flat fee arrangements are also negotiated. English, Spanish as well as a Bengali interpreter are available. Serving the Bergen-Passaic Counties, my practice mirrors the types of cases that people in these communities require, such as traffic, divorce or child custody and child support, residential real estate, and some civil litigation including debtor/creditor cases. I started as an attorney later in life, so I had a good deal of life experience prior to becoming an attorney. I believe that has helped me to be a more rounded practitioner to handle trials and matters that require attention to detail. I studied history at SUNY @ Stony Brook in New York and later attended and graduated from New York Law School where I received my J.D. in 1995. I was admitted to practice in both New York and New Jersey in 1996. I have done trial work in both New York and New Jersey and have been involved in preparing a number of appeals. At present, my practice is limited to New Jersey. Prior to becoming a lawyer, I had been a public school teacher in New York City, so I have had life experience before going into the legal profession.